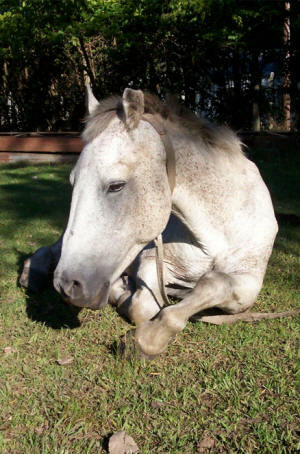 Coco was a horse used and abused by pickers and cart drivers. He worked tirelessly, beyond his strength, and from sunrise to sunset. The load was exceeded in poorly nourished for a long time. He passed through several cruel and ruthless hands. When the load carrying was very excessive, without more forces the horse fell, and in retaliation to forcing him. Those people even cut off part of one of his ears. Coco wasn`t good for rough work for which they wanted to use him. A passing “cartonero” (man who work with cartons) found him and decided to take him, but he continued using for the same: load large amounts of trash and junk, until Coco´s spine and front legs were broken. these men abused him until he lost the strength to continue working. They wanted to sacrifice Coco. When the founders of Farm Sanctuary became aware of the situation, they did not hesitate: Coco moved to Paradise. They saw several vets, many came to help him, but Coco seemed to have made the decision. Entire nights watching his health, and medication from serum as directed by veterinarians. Gabriela and Armando put all his strength to stop it again and again, to pamper and soothe their wounds. We let them know that our dear and beloved Coco, put on his long wings and flew to heaven, where there will surely cure all your aches, pains, injuries and ill-treatment received and finally be happy whinny jumping from cloud to cloud. So from here we want to involve all those who cared and took of this suffering horse, to join us in this kind of prayer to all indignant abuse inflicted on animals, to greet you on this journey that frees so much pain. We do not want to shed tears for Coco, but with our tighten chests and this pain hug us in a loud sob, at the moment we have other horses rescued in similar conditions to Coco, and we will always be with them. We Hope that you can help us from overseas countries to buy food and vet cares to our 16 horses, cows, bull and the other animals friend that lives with us in our animal sanctuary. We know we cannot stop the cruelty in the four most important items against animals: Entertainment, Food, Labs and Clothing. But we are giving our best to recover as many animals as we can and we want to tell you that our farm is a candle in the dark.